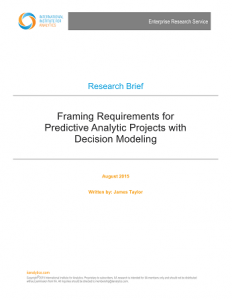 I am faculty member for the International Institute for Analytics (IIA) and recently completed a new research brief on Framing Requirements for Predictive Analytic Projects with Decision Modeling. The Research Brief is behind the paywall for IIA clients with an Enterprise Research Subscription. If you are interested in IIA membership and the research that IIA produces check out the site. IIA does a lot of great research and runs regular phone briefings too (I will be doing one on this topic soon). Organizations are struggling to create a scalable, sustainable operating model for decisions driven by predictive analytics. In particular, firms need to a) ensure that predictive analytic projects address real business problems, b) engage a broad business audience in defining these problems, c) prioritize projects based on these definitions and d) ensure their analytic efforts deliver solutions to these problems. Decision modeling, specifically decision modeling using a newly standardized notation, is an approach that explicitly defines the decision that will be improved by the predictive analytic before beginning the project. Members can get the brief here and you can sign up as a member here.